This poster is dy-na-mite! 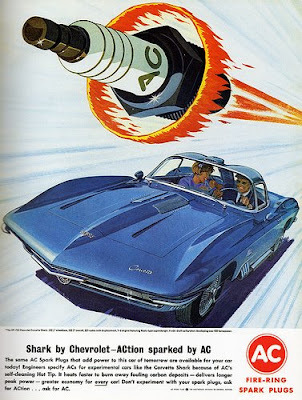 You gotta love that aerodynamic spark plug (and Chevrolet)! I wonder who did the design / illustration? The complimentary colors make the ad pop! Its definitely a design descendant of Art Deco "streamlining". I love it, too. Notice the slightly crazy guy driving the car. It leaves me a little sad as ACDelco is now for sale and the offices on Hill Rd will be empty is less than a year.